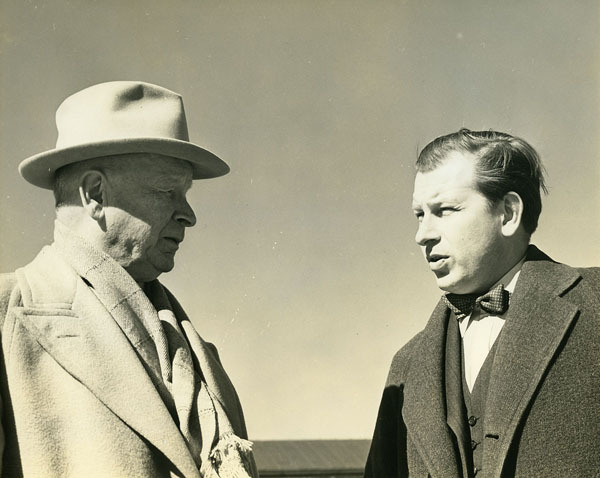 August 20th is a big occasion here at Cranbrook–the day both our campus architect Eliel Saarinen (Finnish, 1873 – 1950) and his architect son Eero (Finnish-American, 1910 – 1961) entered this world! In honor of two great men from one of the design community’s most accomplished families (read blog posts about matriarch Loja Saarinen here and Eero’s big sister Pipsan here), today on the blog we’ll visit the Saarinen House dining room, where father-and-son birthdays were most certainly celebrated on many an August 20th throughout the 1930s. 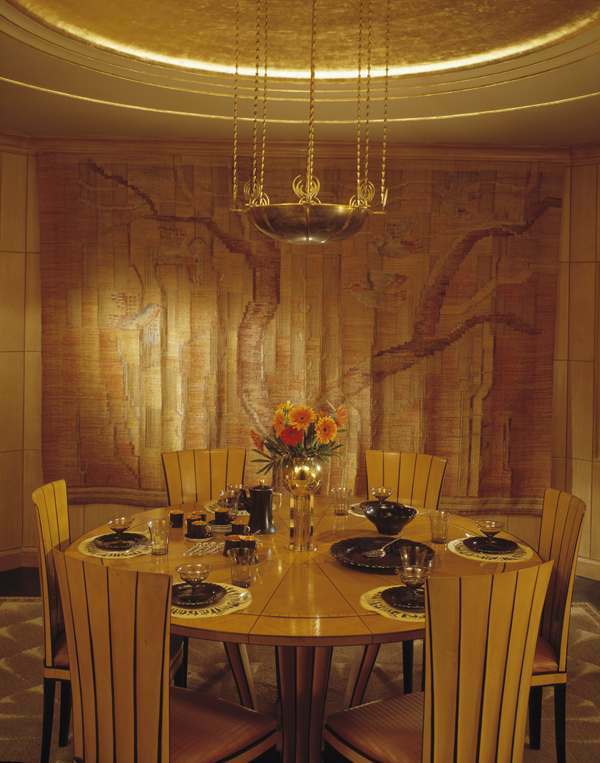 Saarinen House Dining Room, designed 1928; restored 1994. Photo by Balthazar Korab, (c) Cranbrook Art Museum. Eliel Saarinen designed Saarinen House as his personal family residence on Cranbrook’s Art Academy campus, and it was conceived as a total work of art: from the architectural footprint down to the silverware, everything harmonized perfectly as an artistic whole. 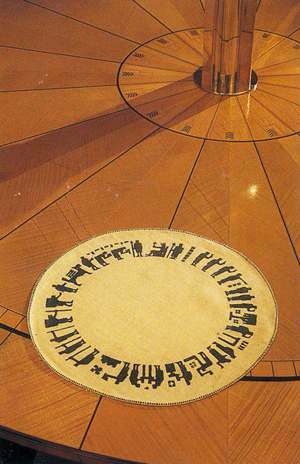 If you look at the photograph above (taking into account a slightly skewed perspective due to the camera lens), you can see how he’s created a circular table to sit precisely at the heart of the square rug beneath it, both of which were centered under a gilded, domed ceiling with a brass lamp suspended below. You could draw a straight line from the middle of that dome down to the floor and each side of the room would be perfectly symmetrical–an ideal environment for lively conversation during a birthday fête! Eero Saarinen, Placemat, block-printed linen, circa 1920, CAM 1988.55. Photo by Balthazar Korab, (c) Cranbrook Art Museum. 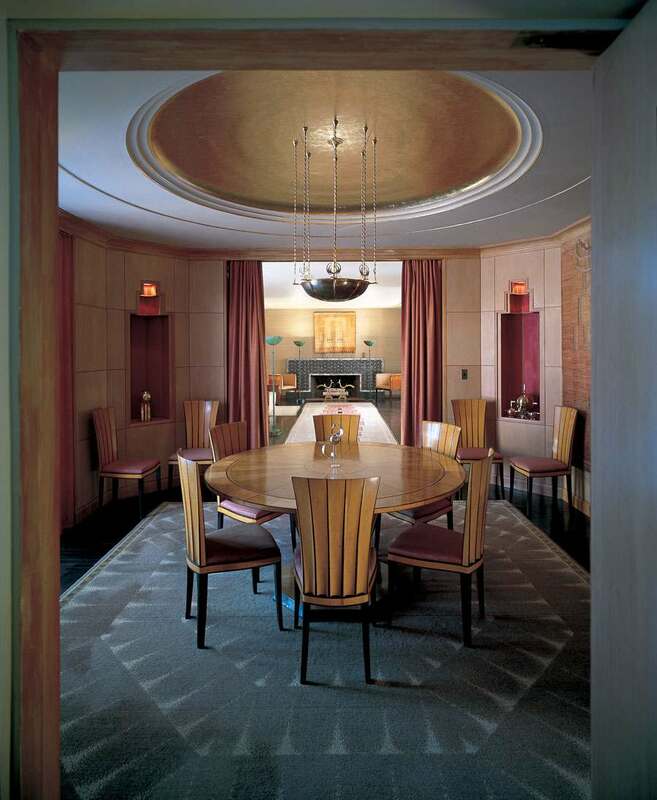 When the house was restored to its original splendor in the early 1990s (it was renovated many times by subsequent tenants after Eliel died in 1950), Pipsan Saarinen’s son Ronald donated six placemats designed by Eero to Cranbrook Art Museum. They were made around 1920–when Eero would have been just ten years old–and with figures of kings, toiling laborers, and slowly aging vagabonds punctuated by a Finnish flag, I’m inclined to speculate that he was depicting Finland’s struggle for independence from the Russian Empire (and the Swedes before that), which it had only gained in 1917. And if perhaps these placemats were created after Howard Carter’s discovery of King Tuthankhamun’s tomb in 1922, the fad for all things Egyptian–including hieroglyphic forms–may have had an influence on young Eero as well. Saarinen House dining room, with Gefle dinnerware, Orrefors glassware, and Eero Saarinen placemats. Wall Hanging: Landscape with Tree and Birds designed and woven by Greta Skogster between 1935 and 1939. Photo by Balthazar Korab, (c) Cranbrook Art Museum. Can’t you just imagine the family gathered at the dining room table, under the glow of that golden ceiling, with Eero’s placemats supporting fine occasional dinnerware as he and Eliel blow out the candles on their birthday cake? Especially if it was this one? And for those of you that don’t know, Cranbrook Art Museum holds tours of Saarinen House every week, Thursday through Sunday from May to October. Click here to view our tour schedules and rates, and learn more about the home and it’s history!